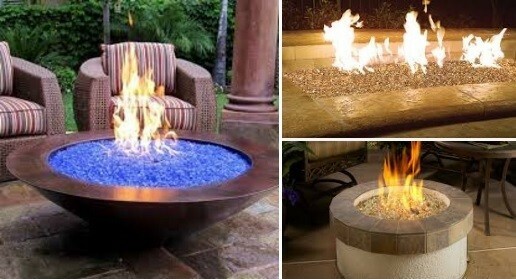 Not only are copper fire pits durable, but their fancy design will liven up your backyard in no time. Since it has a higher melting point, you can rest assured that your pit is going to last for quite some time. The beautiful metal coloring also make them quite attractive. Even though they are a little costlier than a cast iron pit, they will make up for it with their extended lifespan. They come in an assortment of styles and sizes. These enclosed pits are taller than what they are wide. Their tops resemble a chimney. They are available in an assortment of different styles and materials. While some are made out of metal, others are made from terra cotta. Gas pits are ideal for those who don’t want to mess with firewood, lighting fires or having to mess with the ash. They operate on both natural gas and propane. This outdoor fire put tends to be quite popular because of its overall thickness, thus helping it last for quite some time. Not only is it portable, but it has a deeper basin composed of a thicker steel shell. There are an abundance of models available, including ones with stars, moons, wildlife and any number of other designs. You can even connect it with your grill to cook food. There is a motorized rotisserie you can purchase to cook your large cuts as well. Choose from a built-in stone or portable option. Either one will bring style and flair to your deck or patio. They resemble a traditional fireplace and come in wood-burning or gas options. Whether you want to buy a top-notch fire pit or build a fire pit, Hi-Tech Appliance is your one-stop shop for all your outdoor kitchen needs in Colorado. Get a free quote here.